The CanalView at Dilmunia ... next to a sweeping canal promenade. NSCC International, an Abu Dhabi-based contractor, has been engaged to carry out an early works contract worth $4.5 million from Ithmaar Development Company (IDC) for the Dilmunia Grand Canal and Marina in Bahrain. The $1.6-billion Dilmunia is a mixed-use development being built on a man-made island off the coast of Muharraq with a unique health and wellness anchor including residences, a hotel and leisure and shopping districts anchored around a health and wellness cluster. The development of the 125-hectare man-made island is being managed by IDC, a wholly-owned subsidiary of Ithmaar Bank, a Bahrain-based Islamic retail bank. The Dilmunia Grand Canal and Marina, a major element of the development, will feature public promenades, geysers, water fountains, water walls, cascades, boardwalks and viewing decks. With a total length of 1.7 km, and a width spanning 15 to 35 m throughout the Grand Canal, it will have sea water pumped in around the mid-point of the canal with the water flowing via gravity in two opposing directions of the entire canal. 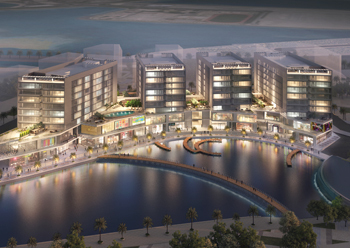 The Grand Canal will cut through the entire stretch of Dilmunia in a semi-circular route, making it Bahrain’s largest man-made water body and providing breathtaking vistas to surrounding developments within Dilmunia, and one of the kingdom’s longest continuous promenades to residents and visitors of the island. An expert in the field of foundation engineering, ground improvement, onshore marine works and horizontal directional drilling, NSCC says its track record in the GCC includes works in Abu Dhabi, Dubai and in Bahrain, where it was engaged for two tower projects in Bahrain Bay. Dilmunia completed its Phase Two infrastructure works in December 2017, and awarded the third and final phase early last year and with it ensuring the availability of all services to developers constructing on the island and its first residents. The commencement of the Grand Canal and Marina works has set the tone for the upcoming attractions IDC is set to unveil together with stakeholders of Dilmunia. Jean-Claude Bejjani, the project director of Dilmunia, says the awarded works in Dilmunia consist of soil improvement, soil levelling and contiguous pile works. These works are preparatory to the construction of the Grand Canal, which will commence after the execution of the early works. It is targeted for completion in mid-March this year. Issam Khoury, vice president, overseeing the execution of the early works, says the NSCC team led by Hazem Nour, the project director, is keen to demonstrate its capability, and having worked closely with IDC’s team in the past few months, is confident of delivering on the targets.